This article was originally published on Videri.org and is republished here with their permission. 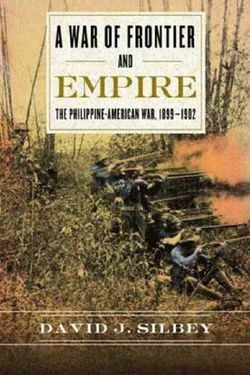 David Silbey's A War of Frontier and Empire: The Philippine American War is a narrative history of the complexity and shifting definitions of the war between the U.S. and the Philippines in the late nineteenth and early twentieth centuries. Silbey weaves the threads of impact together, arguing that for the U.S., “It was a war that brought together the dominant American experience….the chaotic and defining expansion westward, with a new…and uncomfortable imperial ambition” (xiii). For the Philippines, the war resulted in a culturally and socially fractured collection of islands becoming a “self-conceived nation” via a shared experience of revolution, war and insurgency. Silbey is careful to not label the conflict as just an insurgency, or a larger war, or just a revolution. Rather, he describes three distinct conflicts each with their own characterization and description. The first was the war between the Spanish and the allied U.S. and Filipino forces. The second was a conventional war between the U.S. Army and Navy and the Philippine Republic’s Army of Liberation. The third was a guerilla war fought between the U.S. forces and insurgent and disparate alliances of groups broken off from the Army of Liberation and elsewhere. Organized into six chapters, Silbey first traces the Spanish history of the Philippines, noting the influence of Catholicism and Spanish legal codes on the native people, as well as the distinct social structure and multiple languages that were in place. At the same time, the U.S. was beginning to conceive of itself as a naval and imperial power (influenced by Alfred Thayer Mahan’s book) that coincided with their vision of exceptionalism and frontier acquisition. The election of the first “imperial president” William McKinley capped this self-conceived trajectory and influenced the U.S. to declare war on Spain in the Philippines after the Cuban revolution resulted in the explosion of the battleship Maine. The U.S. joined in an uncomfortable alliance with Emilio Aguinaldo, the self-proclaimed governor, who was interested in enacting an elite republic and not a democracy. Ultimately, the McKinley administration decided after they defeated the Spanish at Manila Bay that they merely had to take control, which led to war with Aguinaldo’s forces. Silbey details the outbreak of war on February 4th, 1899 between the two sides, pointing to several reasons why that date was significant, including how soldiers in the Army of Liberation conceived of their military duties as defined by loose and shifting loyalties to superiors. Silbey shows how and why the U.S. forces were so successful against the Filipinos in the conventional war, pointing to naval gunfire effects, differences in technology and lack of ammunition to practice with on the Filipino side. He also emphasizes that Aguinaldo’s control was limited over his forces, that Filipinos had a “different cultural conception of what war meant” and that their battle tactics, such as firing high allowed U.S. forces to get up close and personal during battle. At home, the war was not supported by everyone (mainly eastern elites), but poems like Rudyard Kipling’s “White Man’s Burden” and imperialist propaganda helped solidify support for “manifest destiny including the archipelago” (96). The capture of Aguinaldo in December of 1899 reinforced these convictions, even as the U.S. forces began to bring various Filipino factions on their side, including the hemp traders (since the U.S. helped the trade begin again), and established a more streamlined legal system that replaced the corrupt and confusing Spanish one. Silbey’s last chapters detail the critical shift toward guerilla warfare that characterized the last aspects of the conflict. He discusses the U.S. use of unsanctioned torture, starvation of civilians and encouragement of disease, even as the Filipinos fought fiercely, including at Balangiga (what the U.S. termed a “massacre”) in the face of diminishing hope to establish an independent nation. These tumultuous events were set against the political background at home in the U.S., including the Election of 1900, McKinley’s assassination and Roosevelt’s new influences on the presidency. Perceptions of race, the rise of Jim Crow, the impact of black soldiers, and white views of Filipinos also play a part in this discussion. In the Philippines, Sibley shows how U.S. political and military forces vied for power and control in the figures of MacArthur and Taft. Ultimately, he concludes the Filipinos themselves figured out how to adjust to the new reality, and the war came to represent a “nationalist totem” (210) that helped to unify them. He is also careful to conclude that it was not a total war by the U.S. on the Philippines – the Filipino side had some critical victories and advantages that softened their attitudes and led to an acceptance of U.S. power. Silbey describes this as a “crossroads” in which the shifting threads of defeat, unification, and imperialism reshaped both U.S. power and the Philippines as a nation in the twentieth century. Check out other great articles at Videri.org. How did the United States Escalate the Vietnam War? Fact and fiction the Battle of Hastings (1066)? How did Mussolini Rise to Power as the Dictator of Italy? How Did Lysimachus Impact the Hellenistic World? This page was last edited on 8 March 2019, at 12:25.